If there's one thing life has taught me, it's to never underestimate what small critters can do.I used to work at a pet store, and whenever I reached into the hamster cages, I'd furtively hope that they'd spare me the pain of taking a chunk out of my hand. 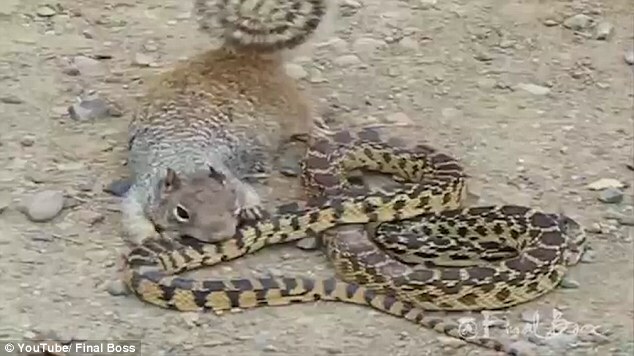 Even squirrels are not to be messed with -- one of my co-workers there told me that while she was trying to help an injured one, it bit her down to the bone.This African squirrel is no different, because when it got especially hungry, it chose a nearby snake for its next meal. It looked like the squirrel had a death wish at first, but it proved that it was more than up for the challenge.While a squirrel's diet consists mostly of plants, nuts, and seeds, some will eat meat if they become hungry enough.